Selling our home was a very stressful time. However, from the first meeting with Peter, right to the last, he was professional, prepared and focused. Through phone calls, emails and text messages, Peter always responded promptly. His creative advertising methods, along with his personality and dedication was in no doubt the reason our home sold in two weeks! I would not just suggest, but highly recommend Peter, to sell your home. We will forever be thankful for his hard work and commitment. Peter, thank you! When Peter and I met for our initial meeting he came very well prepared. He had samples of similar properties in the area and their asking and selling prices. He knew the age of the building we were dealing with and helped me set a realistic price. He gave some valuable advice based upon my situation and abilities and he was always available for questions. With his expert guidance the property sold in less than 4 weeks. Great service and someone I would gladly recommend to friends. 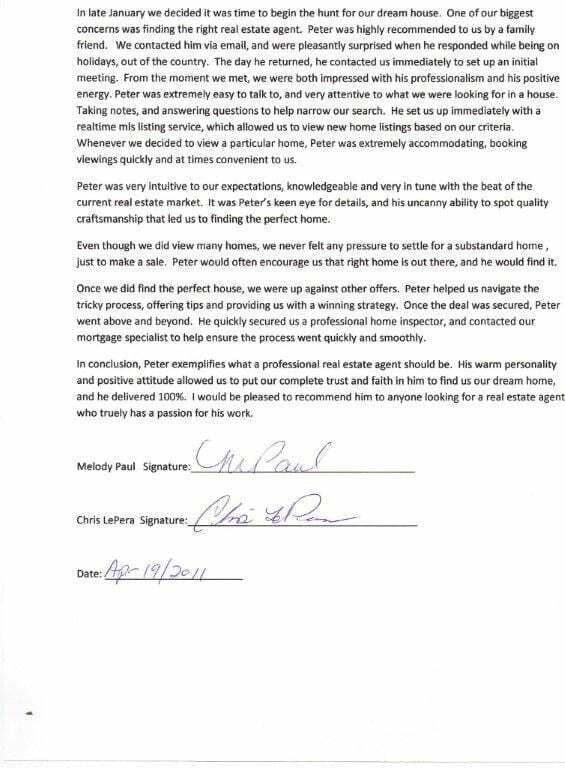 We had our home on the market for 6 unsuccessful months with another realtor before contacting Peter. We had to have this house sold ASAP. Peter was more than willing to help and was positive that he would be able to get our home sold. Low and behold he lived up to it; our house was sold within a month of being listed with him. He was very honest and forthcoming with everything. He was very easy to talk to and to get a hold of. He always put us first and keep us updated daily. We would highly recommend Peter to anyone looking for realty services. Peter is our absolute first choice for anything to do with real estate. We’ve sought his expertise as both sellers and buyers. For such a deeply personal and significant purchase, you need someone with strong work ethic, reliability, knowledge, authenticity and transparency. He embodies all of these qualities, he’s an all around good guy and is a lot of fun to work with. difficult event and made it look easy. that you have made the right decision. Thanks Peter, I will always be grateful for your hard work and friendship. 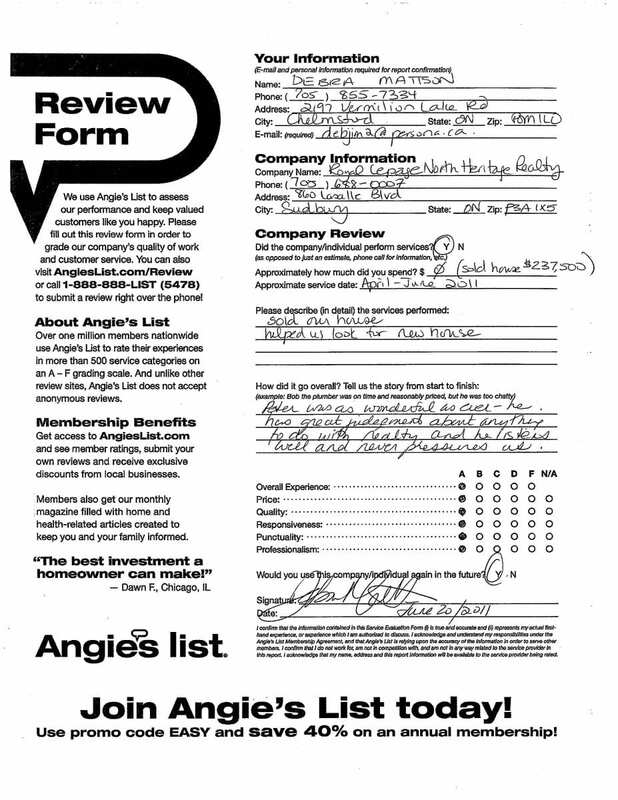 When we decided to start looking for our dream home, one of the first steps was to find an agent. The whole process is quite overwhelming as first time home buyers, so we wanted someone with experience, creditably, who would be very honest, and available for all of our questions. We were very impressed when we met with Peter to discuss our options as he had all of these great qualities as an agent! He always responded to our messages promptly, and shared all the excitement we had throughout the process. Fortunately for me, when I had to do an estate sale of a home in Sudbury, ON, and being from London, ON, the reputation and effectiveness of real estate agent Peter Trottier (Royal Lepage North Heritage Realty) preceded him, so I had an easy choice to have him handle the sale. From my experience, Peter was very professional and knowledgeable, providing real estate information and realistic market analysis from day one. He was passionate and confident about selling, and came prepared, inspecting the home, taking pictures, getting the for-sale sign placed, and presenting featured advertising immediately! As well, it was fun working with Peter because he is very personable and a good communicator and was always available without delay if I had any questions or concerns. In fact, Peter called me when I was out of country, and the home sold at that time, more quickly that I had ever anticipated with the entire process going very smoothly! Thank you for the exceptional service and hard work on my behalf Peter. I have already recommended you to others in Sudbury! Mary Marriott, London, ON, seller Sudbury, ON. April 2018. Thanks Peter. I feel we did well to. I appreciate your patience in a tough job. That is why I wanted to use you again because I knew that you would do the work required to get the job done. Thanks for a job well done. We decided to begin our search for the perfect home in the summer and thanks to Peter’s true dedication to his clients we were in the process of buying it by Christmas time. Armed with patience and perseverance, we embarked on the journey to find a home that would accommodate our special needs son. This was difficult because of the high level of criteria, but Peter embraced this, always keeping in mind our wants and needs. Thank you Peter for always making yourself available and for responding so quickly to our requests. I worked with Peter when I was looking for my first home. His friendliness and professionalism is one of the reasons why I chose him. Not only that, but as a first time home owner, Peter was able to assist with what I needed to look for when purchasing a house. After the deal was closed, his service didn’t stop there. He regularly checks in with me and often recommends contractors and services for work that is required on my home. Thank you for all your help Peter! Thank you Peter for your patience and dedication in helping us sell our house and find a new home. We were happy that you were with us on this journey for the second time. It was a long journey full of ups and downs but in the end we are pleased with our home and the service you provided. Should we require real estate services in the future you would be our first call. Julie and Jean-Marc. Here is a little something for you, I am so sorry I had completely forgotten about it. Thanks for the reminder. After interviewing a number of realtors we were fortunate to meet Peter. Peter’s positive attitude is matched by his knowledge of the Sudbury market and his professionalism. With Peter’s expert advice and realistic appraisal we were able to sell our home within 3weeks of listing. Thank you Peter for your excellent service! Two Deals…Bought Nov.2015 and Sold Dec.2015!! We had been looking for a new home, informally, for over a year. We always approached the selling agent to view properties. During that time, we met many of Sudbury’s Realtors. Peter was the listing agent on a property we viewed, and we immediately loved his realism and attention to detail. We choose Peter to help us purchase the property of our choice, when that time arrived. He got us all the info and details required very quickly, so we could execute that deal…which we did! Very satisfied, and so we chose Peter to sell our current property. With his years of experience and guidance, we were able to sell our home quickly and with minimal stress. Thanks a lot Peter for everything! P.S. We would be happy to share our experience with interested individuals! Peter was recommended by my niece. She assured me he was the agent i should consider. We met and chatted and my husband and i decided that we would have Peter to look after our sale. Peter was always available.He would promptly return our calls or emails. Very professional and very loyal. I wish to thank you Peter for all the hard work you put in this to sell our home..You truly are devoted to your work and clients….